You like this blog theme? Continue with the Step 2 button. Draw in the world of music and create your own space on the web to share your interests of songs, styles and artists. 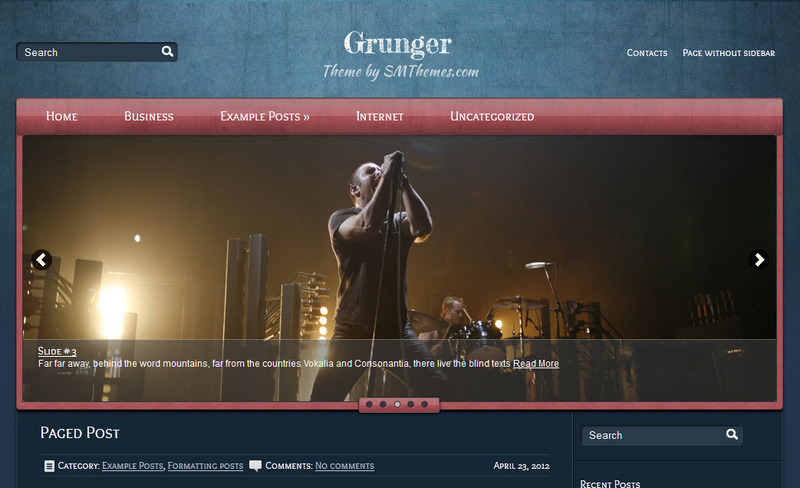 Choose the blue WordPress theme Grunger for your blog and you will not regret it. Custom sidebars and menus, horizontal menus and a slider, simple layout that completes the inviting appearance of your site – this is only a small part of what this theme offers for you. The central slideshow is framed by dark pink to grab visitors’ attention at the first look. The theme features search box, as well as contact page and a variety of categories for the most effective and fast navigation through the blog. Every blog post provides the possibility to include content in different formats, like videos, text and images and to edit it, until you reach the perfect appearance. The theme is responsive and SEO optimized to meet the demands of the modern digital world and to satisfy your visitors’ expectations. Collect opinions and feedbacks from your audience right on your site below every post or check out the opinions for your blog on the special networks through sharing via the social bar. You will be surprised how fast and easy your site will grow popular, especially if you manage to reach multilingual audience with the translation options provided in Grunger.